You must clean each zone full of zombies with your gun... and don't be eated! 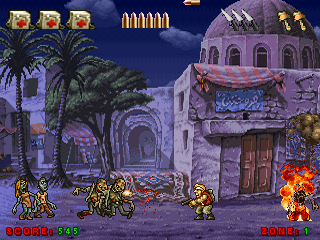 Cool Metal Slug graphics with amazing sound. WINDOWS VERSION MIRROR: https://dl.dropbox.com/u/29724108/Metal%20Slug%20Zombies%20%23PC.rar ANY FEEDBACK IS WELCOMED! This game is awesome, and extremely addictive! I can't make it past zone 7, has anyone? I think my maximum kill count was 121.